Still birding between showers and longing for a long, long birding trip (say to sunnier northern California), but it’s hard to complain when you’re retired and can take advantage of sunny breaks no matter when they occur. It’s been quite awhile since I’ve been to lake Waughop so I was hoping to see some different birds, but it wasn’t to be. The lake was really high with all the recent rain, so there were very few birds feeding close to shore. I only managed to get this shot of Double-Crested Cormorants hanging out in the bushes. Undeterred, I stopped off at Titlow Park on the way home. Although I often see Widgeons offshore in Port Orchard, it’s been awhile since I’ve bothered to get this close to one. Absence obviously makes the heart fonder, so I was more impressed than usual by the bird’s plumage. particularly after emerging from a dive. Luckily, On1 Photo 10 has pretty good noise reduction capabilities. The ten minutes I spent taking shots of the Belted Kingfisher made my day and made me forget how few shots I actually got on this trip. After weeks of being housebound for various reasons, we’ve had an unusual break from the rain so I’ve gotten out more this week than I have for quite a while and took the opportunity to visit several areas I haven’t visited for months. 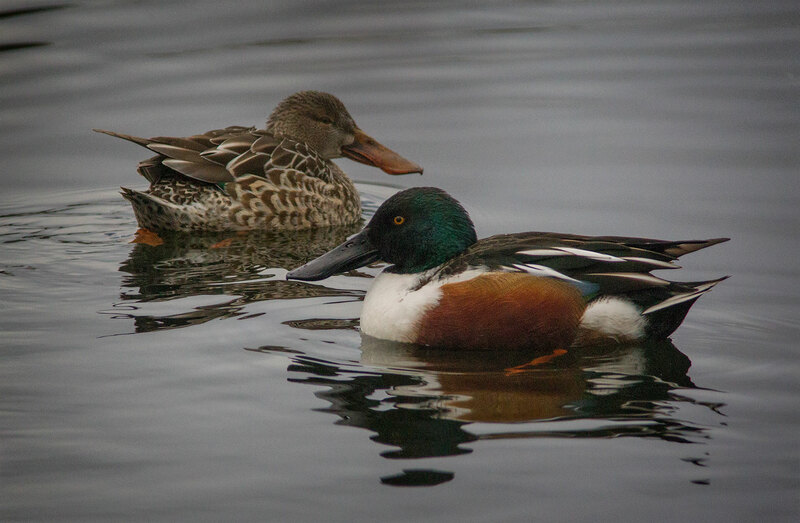 Lake Waughop was crowded with Northern Shovelers, a duck I haven’t seen for so long that I forgot how striking they actually are. Of course, it’s that Jimmy Durante snoz that immediately gets your attention, but the male’s plumage is also quite striking, especially this time of year. On my way back, I stopped off at Titlow park, another place I used to visit regularly but haven’t visited for months. 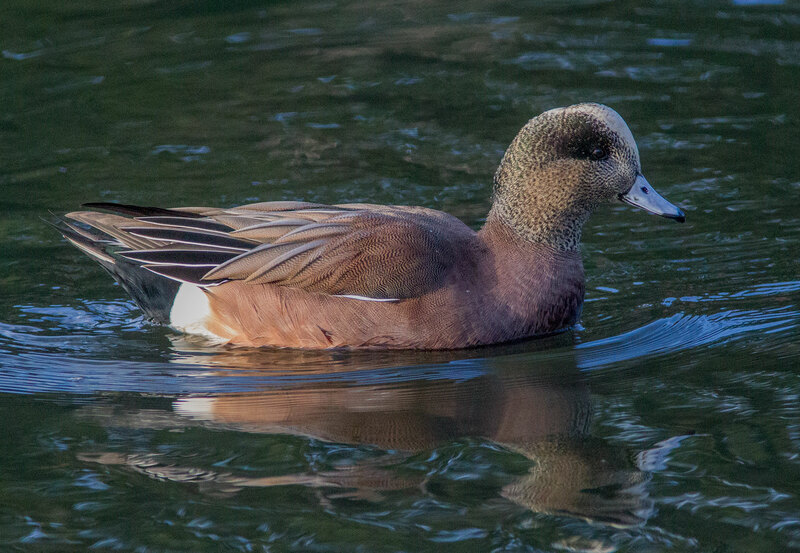 I hoped to see an Eurasian Widgeon, but wasn’t a single one in sight so I had to settle for this shot of a male American Widgeon. Actually, I was a little disappointed with how few birds I found there. I wonder if all the new construction intended to restore the pond has actually driven birds away. I’d hoped to go to Nisqually, but the promised sunshine hadn’t appeared by 1:00 PM so I decided to delay that trip to the next sunny day and, instead, drove down to the boathouse which is less than a half mile from my house. 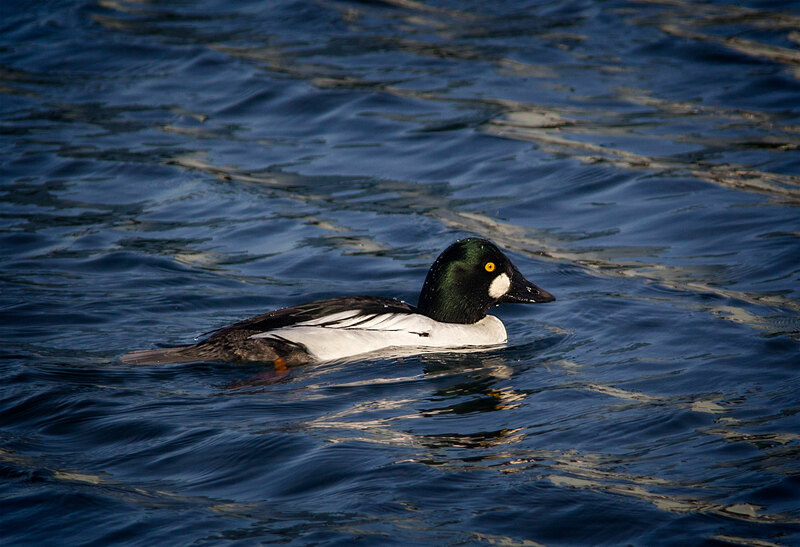 a bird I used to see rarely but is now seen more often than the “common” Goldeneye. I would have entirely missed this last shot if the State Patrol Officer hadn’t pointed it out to me, but it somehow seems appropriate this weekend. 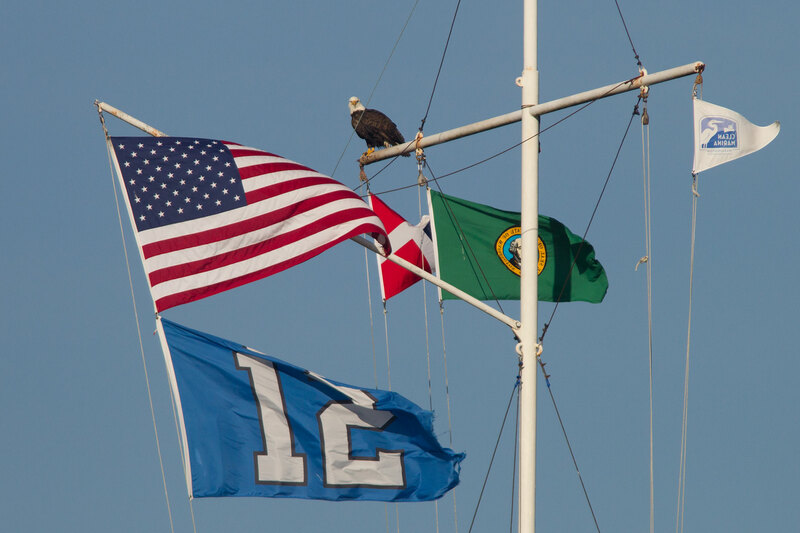 Around Seattle the 12th Man Flag seems more popular than even the American Flag, and certainly more popular than the Washington State Flag. Hopefully that will continue to be true after Sunday’s game. Having finished my gardening chores the day before, I couldn’t resist going out birding again on Wednesday, this time to Waughop Lake and Titlow. Unfortunately, the highlight of the day was the sunshine and an opportunity to talk to a photographer I’d not met before. floating in the middle of the lake along with some Ring-Necked Ducks too far out to get a shot even with a 560mm telephoto. Birding was a bit better at Titlow where I noted the return of the Widgeons like this female. 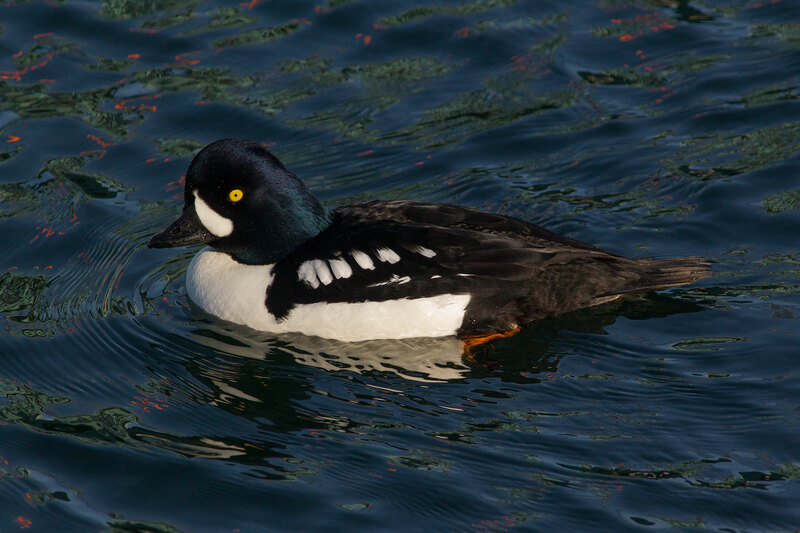 but I appreciated the chance to get something other than another shot of a duck just floating. The real entertainment of the day, though, was watching this Merganser try to slink away with this rather large fish which was obviously far too big to swallow but he didn’t want to share. Photographically it was a wasted day. I’ve been trying to sort through the thousands of shots residing on my hard drive(s), deleting shot after shot that’s not as good as other shots for weeks now. At times it seems like a never-ending job, like cleaning a house or cooking a meal, but it did make me resolve to immediately sort through every future shoot, deleting those that aren’t as good as previous shots of the same birds. I deleted every shot taken during the day even these after I’d posted them to my blog. Wednesday featured both brilliant sunshine and lowering clouds that blacked out the sky. Inspired by the early sunshine I headed out for a day of birding, but didn’t get any further than Titlow because the sunshine disappeared during the hour I spent there. because I’d never noticed the green wing stripe before. but when I realized that it had a plastic sack stuck around its bill, it ruined the entire shot. I would have waded into the freezing water to try to free it if I’d thought it would stay put, but he seemed too healthy for that. Hopefully, he will be able to free himself from it somehow, but for me it served as yet another reminder of how we have despoiled this environment we must all share.